When it comes to building around mechanics, I like the simple ones. Forget that Prowl or Explore nonsense—I want something straightforward. Since we’re in Ravnica right now, I think I’ve got just the thing. This week on Mechanically Minded, let’s talk about Undergrowth. A nice, simple, direct mechanic. When you cast a spell or your creature enters the battlefield, just count up the number of creatures in your graveyard and replace that number with whatever’s on the card. Simple, yet deadly. Let’s build around it and see if we can maximize its power. It’s basically the black Swords to Plowshares, only with no downside (well, a little downside; you do have to set it up). A nice start! We still need someone to be the lead singer for our band, yes? So why not Izoni, Thousand-Eyed? I do like Izoni and I definitely want her in our deck. However, I have a different token maker in mind for our commander. However, before I reveal it, I’d like to go off on a seemingly random tangent. The year is 2011. The current set is an odd one. Wizards R&D is calling this set a “top-down design,” which is a term nobody’s heard much of before. This means they’ve chosen an aesthetic and then designed the set around that aesthetic, rather than the other way around, choosing the game mechanics and designing the world around those. The aesthetic they’ve chosen is gothic horror. The set, of course, is Innistrad! Spider Spawning is one of the coolest (and perhaps strangest) build-around cards we’ve ever seen. 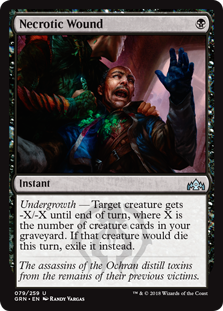 It’s best when paired with self-mill effects because they simultaneously dump creatures into your graveyard, not to menation the Spider Spawning itself, which you can then cast for its Flashback cost. However, casting Spider Spawning once (or twice) isn’t all that impressive. If we want to takefull command of its Undergrowth-y goodness, we must repeat. And repeat. Yes, this was a real combo in Innistrad draft. Cast Spawning, Flashback Spawning, re-buy Spawning with Repetition, cast Spawning again, Flashback Spawning again. Assuming you have the lowly sum of just five creatures in your graveyard, that gives you 20 Spider tokens (which are surprisingly good blockers in multiples). And that’s not even nearing your ceiling on this combo’s true potential. So, if we want to play this outstanding Undergrowth payoff, we’ll need to be in Sultai. It wouldn’t hurt to pick a commander who can mill us. Ah! I have just the thing. In terms of general deckbuilding philosophy, most mechanics require two components. First, the enablers. Enablers set up our mechanic and allow it to function. For example, if you were to build around the Enrage mechanic from Ixalan, your enablers would be cards like Prodigal Pyromancer or Pyrohemia. Second, we have payoffs, which are usually the cards with the keywords printed on them. These cards reward you for playing specific enablers. Continuind the Enrage example, Ripjaw Raptor is quite the payoff. Like Spider Spawning, these cards all have Undergrowth without actually having the word printed on them. As you can see, we’ve got some powerful payoffs for dumping a ton of creatures into our yard. So those are our payoffs, but we need more enablers. Sidisi is a nice one, but we won’t be able to attack with a 3/3 for the entire game. We need more help! Yes, there are quite a few self-mill options. Sidisi’s Zombie clause somewhat limits which self-mill effects we want to play, because of its wording. We get one Zombie whenever a creature goes to the graveyard from the library, not one zombie for each going in. 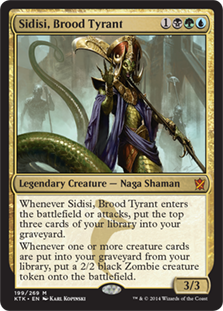 So if we mill three creatures off the top of the deck when Sidisi enters, we only get one zombie. Therefore, we want cards that constantly mill us for one to four cards per activation, preferably with no mana. If you like self-milling, I think you’ll love this deck. I’ve played it several times, and all those Spiders get quite powerful. Plus, it’s fun for Izoni and her insects to join the fray, too! My parting words of advice: Just look out for Bojuka Bog.